»Beaches»Greece or Not to Greece? Greece or Not to Greece? With the American vacation season upon us and people thinking about where they want to go many of my coworkers and friends turn to me with questions – and one question in particular, is it safe to travel to Greece? My answer is, simply, yes. Greece has been one of the safest places to travel for the last 40 years with the most major crime against tourists delivered in the form of over-priced gyros in old town Athens and a few pick pockets. The media has made a lot of the country’s financial problems and the riots of the frustrated population. The Greeks, when they do hold mass demonstrations, mainly do so in the center of Athens outside the parliament in Syntagma Square. I have heard from a family friend in the Athens police department as recently as 5/4/12 who says the city is quiet, calm and ready for visitors. That said, you can probably manage to skip Syntagma on your Athens sightseeing list and just venture into old town or Plaka for a meal and shopping and head up to the Acropolis without a problem. I tell my coworkers there are 777 islands in Greece and they can find one that suits them or stick with the traditional tourist route. If you fancy yourself an island hopper you needn’t worry if you’re no longer a backpack hostelling hippy. With relative ease, you can visit several islands and soak up the culture thanks to the extensive ferry system. While backpacks are easier to maneuver on the ferry boats, every island I’ve visited had plenty of options for accommodations – ranging from the basic campgrounds to hostels to B & Bs and hotels. If you’re on your first trip you should fly into Athens and take a connection to Santorini. The island of Thera (a.k.a. Santorini) is one of those places everyone should see at least once. The white houses look like sugar cubes impossibly clinging to the cliffs around the caldera of a dormant volcano. It’s the perfect setting for what is said to be one of the most romantic sunsets in the world, it is listed in “1,000 Places to See Before You Die” by Patricia Shultz. While on Santorini, you should take some time to have a nice lunch at the Panorama Café. I have fond memories of this place because it has a great view and it’s the first place Amanda and I truly talked about marriage. 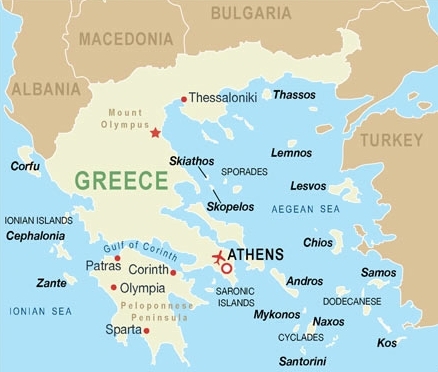 You can work your way back to Athens via ferry from here, and for the most part you can build your itinerary as you go. Find an island you love? Great! Stay there longer than you originally planned, there’s always another ferry on the schedule (with one exception, but we’ll get to that). Start by taking a boat to Paros and Anti Paros, islands in the middle of Cyclades. You can walk around the maze-like streets of the Chora (main town) and eat at tiny cafés and restaurants. You can cross the narrow isthmus to Anti Paros for some quiet time on the beach. Take the next boat to sail to Mykonos. I will admit, this island is not for me. It’s packed to the seams with tourists and filled with over-priced restaurants and clubs. The beaches are nice. 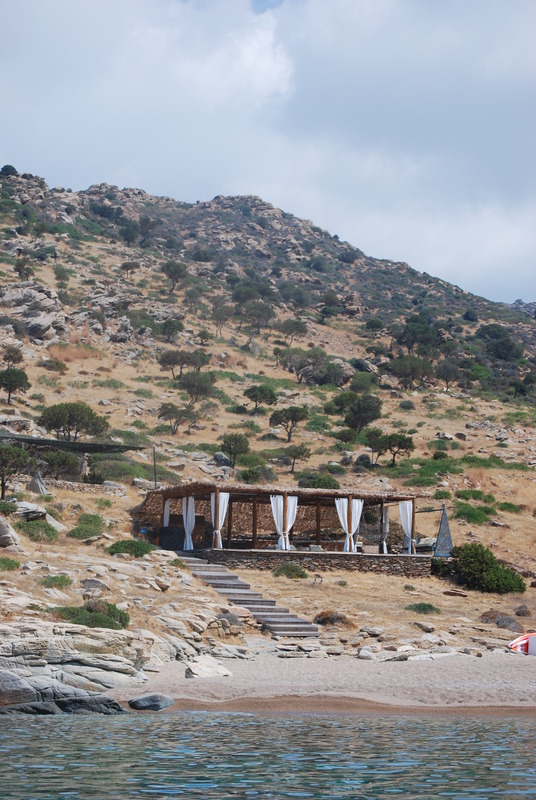 A must not miss while on Mykonos is a side trip to Delos. The entire island of Delos is a museum dedicated to the ancient religious center of Greek world. From Mykonos, catch the ferry to Ios, one of my favorite islands. 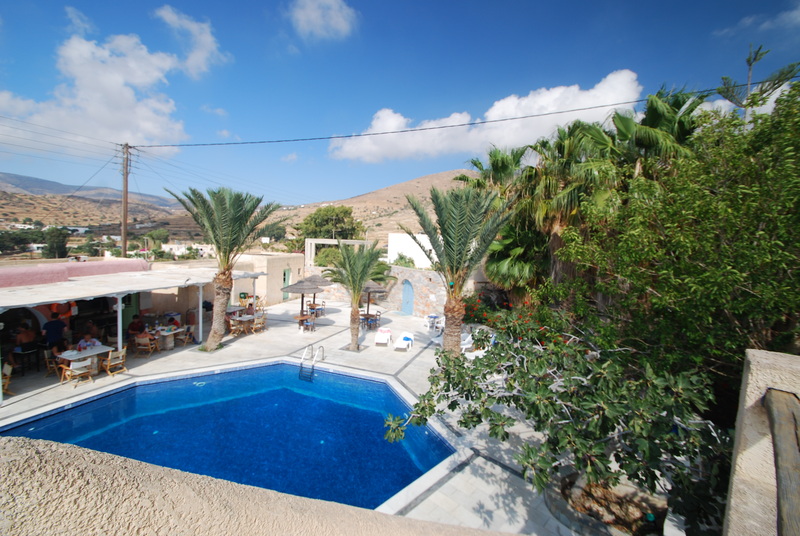 I recommend staying at the welcoming Homers Inn located halfway between the port and Chora. The pool at this hotel is beautiful and the perfect place to spend the hot island afternoons. Ios has a well-earned reputation as a party island with lots of clubs and discos. But if you’re not into the night life you can spend your days on the secluded beaches and quiet narrow streets. You can then hop a high-speed ferry to Athens, although you’ll have to do some advance planning because the high-speeds don’t run every day and book up fast. I suggest getting your high-speed tickets as soon as you arrive on Ios. Then you can enjoy the island and avoid worrying about making it back to Athens on schedule. Plan to spend at least two days in Athens. You can hit the historic hotspots like the Acropolis, Agora and Plaka. 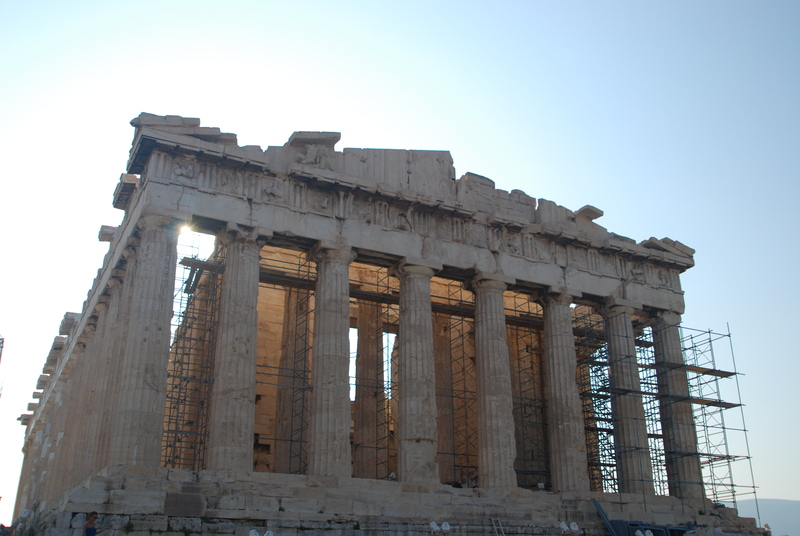 If you’re short on time, be sure to see the Acropolis. You need to stand on the hill and look at the amazing structure and then turn and look at the sprawling city of Athens. I suggest staying in Plaka (Old Town) at the Nefeli Hotel. The small, no-frills hotel is clean and centrally located. I’ve stayed there on four different trips. From the Nefili you can hail a taxi for a quick return trip to the airport and the long flight home. Spend the time resting up after your whirlwind tour of Greece. You might be surprised how tiring it can be hopping from one gorgeous, serene beach to the next! I beleive the hosting is through WordPress.